from the 2013 Trees on Parade. 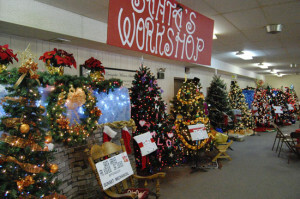 Twin Lakes Area Chamber and Business Association Trees on Parade 2014, sponsored by Allied Plastics, Inc, will take place Friday Dec.5 and Saturday Dec. 6 at St. John the Evangelist Church, 701 Lake Ave., Twin Lakes. Categories for the 2014 Tree Decorating Contest are: Junior, Business and General. New this year is a Gingerbread House Contest. The houses will be created by local high school culinary students. You can visit Santa on Friday from 6 to 8 p.m. or Saturday from 2 to 4 p.m. Kids can have fun in the Children’s Area with creative arts and face painting, sponsored by Mad Dan’s Restaurant. Mom and Dad can catch the Christmas spirit and start their Christmas shopping with over 20 vendors to choose from. Kids get your coloring contest picture from the school turned in on time. Winner get cash prizes. Don’t forget to vote for your favorite Tree and Gingerbread House before you leave. Admission is $2 for adults and $1 for children. The event will include a raffle and a 19″ LED TV/ DVD combo for the door prize. After Trees on Parade closes on Saturday, go to Central Park by the Caboose for the Village Tree Lighting Ceremony and more fun activities. Posted in: Sponsors, Twin Lakes Area Chamber & Bus. Assoc..